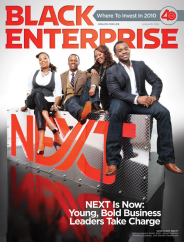 Black Enterprise considers those young entrepreneurs, corporate professionals, and technology innovators who range in age from 21 to 35 and are making a measurable impact within their respective business, organization, or industry to be a part of an exclusive groupâ€”BE Next. Though well-versed in the stories and strife of those innovators, entrepreneurs, and professionals before them, today’s young business leaders have new and different challenges to overcome and therefore flout the stale standard protocol and present a fresh set of strategies for forging their own way. These young entrepreneurs have already positioned themselves way above the curve. For them it’s never business as usual. Their unbridled passion is intent on creating opportunities that satisfy more than just a career choice; they want to touch and influence lives in unique ways. These four fearless BE Nexters managed to find success in the midst of economic uncertainty, and set respective courses to change the game. But let them tell it, there’s no time for congratulations or applause–it’s only the beginning. Nakia Stith was just 22 years old when she went to work at Top of the Clock in 2002, “just to lend a hand,â€ while her father battled kidney disease.Â But the more involved she became, the more she realized that the company had fallen into dire straits with her father away from the helm. “He was in the hospital sometimes for months at a time,â€ she recalls. “And you know, when the cat’s away, things start to happen.â€ It was more serious than she ever could have imagined. She encountered mountains of debt, employee theft, and a poorly functioning infrastructure, among other major concerns facing the struggling company. Bottom line: Top of the Clock (www.topoftheclock.com) needed a massive overhaul or it faced failure. Stith’s father passed away in June 2008, but she is grateful that he was able to see her efforts for the company he built. “My dad and I shared the same vision and passion: We needed to provide for our family and provide a service to the community.